Written for the middle school reader, this biography about Danica is part of Enslow's Heroes of Racing series. This series is correlated to the Common Core College and Career Readiness Anchor Standards. These books are available from your preferred vendor, local bookstore, Amazon, and Barnes and Noble. Veteran driver Jeff Gordon won the second guaranteed spot in this year's Daytona 500. Gordon starts behind Danica Patrick, who's made headlines as the first female driver to win pole position at the Daytona 500. Gordon has three Daytona 500 wins behind him and has a real shot at winning a fourth this year. To learn more about Jeff Gordon's history with the Daytona 500 and with competitive racing in general, check out Jeff Gordon: Racing's Brightest Star by Marty Gitlin. Written especially for reluctant readers, Gitlin's 128 pg. book details Jeff Gordon's racing career, from his start as one of the youngest successful racers, through his later career as a recognized racing champion. 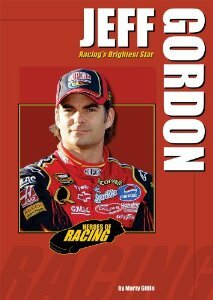 Jeff Gordon: Racing's Brightest Star, included in Enslow's "Heroes of Racing" series, is available directly from Enslow Publishers in a library-bound edition for $23.95. That price represents a 25% school/library discount from Enslow's list price.The book is also available from major vendors, Amazon, and Barnes and Noble. Danica Patrick made her automotive racing name competing in high-profile events such as the Indianapolis 500. Over the past three years, she has gradually moved her racing to the NASCAR stock car circuit. This past week, Patrick enjoyed an historic breakthrough, when she won pole position at the Daytona 500 race. She is the first woman to achieve this victory. "I was brought up to be the fastest driver, not the fastest girl," Patrick said after the event. To learn more about Patrick's competitive character and exciting auto racing experiences, read Enslow Publishers' biography of the driver. Author J. Chris Roselius' 128-page work explores Patrick's compelling life and times on and off the racing circuit. This high-interest book, an excellent choice for reluctant readers, includes full-color photos, reader-friendly pullouts, and excellent chapter notes for further reading. Danica Patrick: Racing to History, included in Enslow's "Heroes of Racing" series, is available directly from Enslow Publishers in a library-bound edition for $23.95. That price represents a 25% school/library discount from Enslow's list price.The book is also available from major vendors, Amazon, and Barnes and Noble. Hopefully the Daytona 500 will get underway tonight. Rain has forced the postponement of this race which is to be Danica Patrick's debut. This is the first of ten scheduled Sprint Cup Series events she is hoping to particpate in. She made the full-time move to NASCAR, racing for the Nationwide Series champtionship as a driver for JR Motorsports. Part of Enslow's Heroes of Racing series, Danica Patrick is written for middle school students who enjoy and want to learn more about NASCAR racing. Other titles in this 12-titles series include: Dale Earnhardt, Jr.; Dale Earnhardt, Sr.; Darrell Waltrip; Jeff Burton; Jeff Gordon; Jimmie Johnson; Kevin Harvick; Mark Martin; Matt Kenseth; Richard Petty; and Tony Stewart. The National Association for Girls and Women in Sports celebrates the 25th annual National Girls & Women in Sports Day with this year's theme, "Play, Believe, Achieve." To celebrate Enslow is featuring our Danica Patrick: Racing to History title from our Heroes of Racing series. Millions of sports fans know the name Danica Patrick—even if they've never watched an indy car race before. As a female driver, Patrick has broken ground for her consistent performances behind the wheel. In 2008, she won the Indy Japan 300, becoming the first woman to win in an Indy Car race. For grades 5–9, this 128-page book is perfect for reluctant readers. In 2008, Danica Patrick became the first female winner in IndyCar history by capturing the Indy Japan 300. Description: Millions of sports fans know the name Danica Patrick—even if they've never watched an indy car race before. As a female driver, Patrick has broken ground for her consistent performances behind the wheel. In 2008, she won the Indy Japan 300, becoming the first woman to win in an Indy Car race.